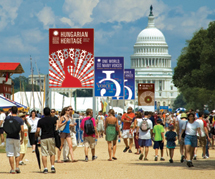 The Smithsonian Folklife Festival on the Mall! Filled with the same rich-curatorial content as your beloved Smithsonian museums and programs, the Folklife Festival is different because the exhibits talk and sometimes sing! The participants at each year’s Festival ARE the showcase and you are the lucky audience! We have been bringing cultural educators to the Nation’s Capital from around the world for 47 festivals and this museum without walls is seriously amazing and different each day. So, come down to the National Mall from July 3-7 and join me for a real treat! Ever wanted to travel to Hungary? Well, this year, we’ve brought Hungary to you! Visit “Hungarian Heritage: Roots to Revival” and bring your dancing shoes for the Dance Barn! “One World, Many Voices: Endangered Languages and Cultural Heritage” brings to life the crisis of language loss. Meet speakers of these endangered languages and hear how they are fighting to protect their culture. Want a sneak peak? Check out the Endangered Languages Story Map to see (and hear) what you’ll encounter in this amazing program. Think what you wear doesn’t say anything about you? Think again! “The Will to Adorn: African American Diversity, Style and Identity” shows all of us that how we present ourselves tells a story and that story is important to our culture. Coinciding with the upcoming Smithsonian Folkways release of ¡Así Kotama!The Flutes of Otavalo, Ecuador on July 2, the musicians of the Hatun Kotama Cultural Center will perform two free evening concerts in Washington, D.C. at the Kennedy Center’s Millennium Stage on Friday, July 5 and Saturday, July 6 at 6 p.m. In addition, the group will perform daily from July 3 to July 7 at the Smithsonian Folklife Festival. Visiting the Festival? Don’t forget to download our Festival app! Enjoy access to daily schedules, site map, participant bios, food menus, and much more. Hope to see you at the Folklife Festival!